Robert Dover’s Olimpick Games at Dover’s Hill, above Chipping Campden and overlooking the Vale of Evesham, is a beautiful plateau commanding extensive views from the plains of the Avon and the Severn to the foothills of the Welsh mountains. Owned by the National Trust, it provides an ideal setting for open air games. 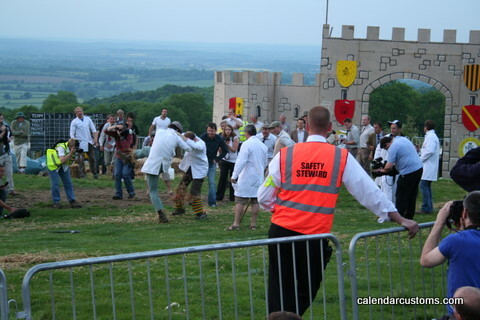 Each year, on the traditional date of Friday after Spring Bank Holiday (the date for the Games this year is Friday 1st June 2018 starting at 7.30pm), the hill echoes with the shouts and cheers of competitors and spectators as Robert Dover’s Cotswold ‘Olimpick’ Games (not Olympic Games) are celebrated. Bands march, cannon fire, rustic activities and wrestling take place, and the evening is brought to a close with fireworks and a torchlight procession into Campden followed by dancing in the square. Date: 31 May to 2 June 2019. Status: The event is ON and space is AVAILABLE. Booking Instructions: No booking required (this is a new field for us). Enquiries: Please call the DA phone on 07562 392 454. Location: Wold End Farm, Chipping Campden, GL55 6HR. Directions: Directions from Cheltenham: A46 to Evesham; on Evesham Bypass take B4035 to Chipping Campden. Please follow Glos D.A. Signs from Weston Subedge to site. Site Facilities: Own Sanitation Essential. Entertainment: Fri night Dover’s Games near by; Sat entertainment in town all day. 2019 St AUSTELL THS - on our Let's Camp! page STEWARDS NEEDED NOW!! Without our Stewards, we would not be able to camp so as always, we all thank them. If you are stewarding, it would be helpful to all members if you would have a look at the event page for your meet (click on the venue name on the Lets Camp page) and send us a message through the Contact page if you need anything updated. Thank you. We hope you can easily find what you are looking for. Please use the search facility on this website and let us know if there is something we can do to improve your experience for next time. All constructive feedback is welcome. Our DA phone is 07562 392 454. See the Code of Conduct. When joining the Group, make sure you answer the 2 questions. Thanks. Copyright © 2019 Gloucestershire District Association. Powered by WordPress. Theme: Spacious by ThemeGrill.